A group of 8th graders from Crane Country Day School recently traveled to Costa Rica and fell in love with the country during their ten day stay. The class of forty students ventured all the way from Santa Barbara, California to the Osa Peninsula! Once the students made it back to California, they realized they wanted to help out in some way. Their trip to Costa Rica had inspired them so much that they decided to raise money for Friends of the Osa. Their efforts proved fruitful as they managed to raise $400. The class chose to support our forest restoration effort on the Osa Biodiversity Center’s Cerro Osa property: our new program plants one native tree for every $10 donation. With the money raised by these students, 40 new trees were planted. We are glad that these students felt so inspired by the trip and hope that they will continue to conserve natural habitat wherever they are. We really appreciate the effort made by the Crane 8th graders and send a big thank you out to these students for their support! Owls may arguably be the most interesting family of birds. There are actually two families of owls, but the Vermiculated Screech Owl (Otus guatemalae) belongs to the Strigidae family of typical owls. Owls are unique to other birds in a multitude of ways. They have specialized wing feathers allowing them to fly silently which enables them to hunt by sound and catch prey easier while avoiding detection. They can actually hear sounds 10 times fainter than a human can and have eyesight 100 times more effective in low light than humans. They are nocturnal predators with eyes that are fixed in the front of their head set in a facial disk of feathers which direct sound waves to large ear openings. Because of their front facing eyes they have to move their heads in a 270 degree arc to see things to the side, and NO, they can’t turn their heads all the way around! The Screech Owls tufts of feathers on the top of their head are referred to as “ears” or “horns” but they are neither ears for hearing nor horns found on mammals. They may be there as a form of non-vocal communication or as a form of camouflage. 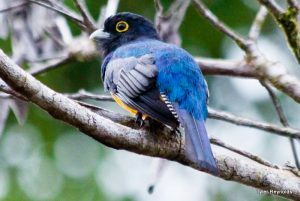 During the day while roosting they erect them in the shape of a V breaking up the shape of the face making it difficult to distinguish them from the tree bark. Of course the owl’s coloration also helps with that. They are mainly found in thickets during the day and are extremely difficult to see at night making them quite illusive to humans. The Vermiculated Screech Owl eats mainly insects such as katydids and beetles. All the flesh is digested and all the indigestible parts (bones, hair, or in this case, the exoskeletons of insects) are formed into pellet castings and regurgitated. They also have a reversible outer toe helping them to grasp prey. They nest in old tree cavities or old nests of other birds (documented in an old trogon nest) laying 2-3 eggs. Incubation is done primarily by the female from 26 – 37 days. Due to the fact that incubation starts after the first egg is layed, owlet nestmates may differ a lot in size and age. When food resources are scarce the older larger chicks may devour their younger siblings. Oh, and you might be wondering why one of the two owls in the photograph is grayish and the other brown. 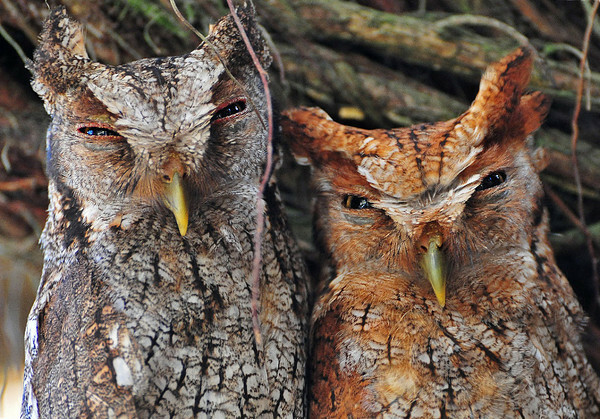 The male and the female are actually alike but there are two different “morphs” or colorations found in Vermiculated Screech Owls; the rufous phase and the brown phase. They are also quite small, about 8 1/2 “which is about the size of a Red-winged Blackbird. You can hear Vermiculated Screech Owls here after dark at Friends of the Osa’s Osa Biodiversity Center but trying to see them is another thing entirely! And in response to people asking what Vermiculated means. It is simply in reference to the wavy vertical markings you see on the breast and belly. This week our photograph comes from Alan Dahl. You can see his photographic galleries at Focused on Nature. 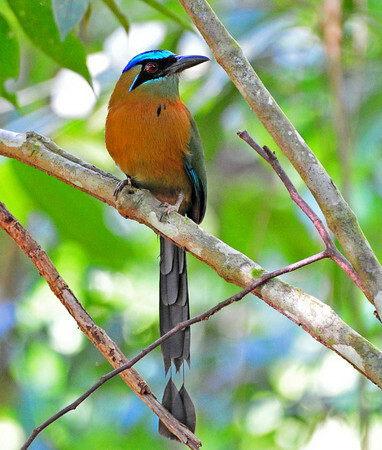 He has a wonderful commitment to conservation and allowing us to show off his photographs is one of the ways he has supported Friends of the Osa and our conservation efforts on the peninsula.